Bio: After a career in graphic design, Connecticut artist Barbara Groff turned full-time professional painter in 2002. Largely self-educated as an artist, she works out of her home-based studio in Vernon. Years of work, experiments with oils, acrylic, watercolour and graphite culminated in her discovery of pastel. Her first pastel painting was the first she entered in a competition - it won best in show! Since then she has garnered numerous national and regional awards. In 2007 she received the Dianne B. Bernhard Gold Medal Award for Pastel at the Allied Artists of America National Exhibition. In 2008 Barbara was featured in The Pastel Journal as one of the top five prize winners in the magazine's Annual Pastel 100 Competition. And in 2009 she was the first place winner in the Still Life and Floral Category. 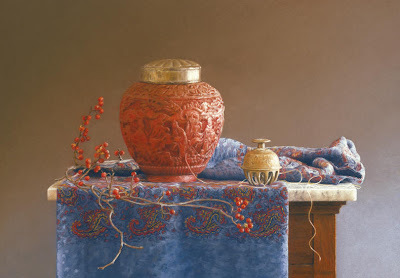 She is a designated Master Pastellist of the Pastel Society of America, and a Signature Member of the Connecticut Pastel Society. She is an elected artist of the Allied Artists of America and is a full member of the Academic Artists Association and the Connecticut Academy of Fine Art. She has been listed in Who's Who in American Art since 2007. Barbara’s art marries a meticulous realism with a conceptual approach to still life which is uniquely her own. Using pastels, she attains a level of realism that is close to photographic. She fulfils the criteria - a unique vision, a unique expression of that vision, and inspirational material - for inclusion in my top ten pastel artists. Gallery: Portfolio consists of three gallery pages accessed by clicking on the appropriate thumbnail. Image View: Each thumbnail enlarges within the gallery page with title and dimension attached to enlarged image. This image may be further enlarged; download is not blocked. Thread to the past is 17x12 ins.